Today we are featuring the set called "Newton's Daydream"
shaded the edges with Faber-Castell's #117 and #121 Aquarelles. (for the background) and the green floral print (for the foreground). I thought it would be the perfect compliment for the little bee stamp! Would you like to win “Newton’s Daydream”? super cute love all of your paper piecing!! Your card just screams adorable!!! I love it. What a sweet card! I'm sure Newton is enjoying some very pleasant dreams! Fun cards! Love the embossed background! Your paper pieced card is so sweet! Very sweet. I like the paper piecing and all the ovals. Love all of the layering and the embossing. The card is beautiful. Newton will be sleeping very well on such a pretty card. Very nice design...love the oval background you have Newton on. Love everything about this card - Newton is colored so professionally, that embossed background is perfect, the pure whiteness of it really makes the ovals POP, and the touch added of Doodlebug Deign paper is so AMAZING!! Way to go - have a great day!! Love this, Shellye, the embossed background is lovely, and I love the patterned papers you used, they really make Newton pop! So sweet ~ I love all the paper piecing! Love that the shading on Newton adds that extra oomph! So pretty! Love that white dry embossed background!! And newton really stands out and shines on your card! Beautiful! I love your colors! The focal point of green and blue with Newton in orange just stands out against the white background--looks awesome! Beautiful layering, textures and colors. There's so much to see! I love cats! Your card is adorable! 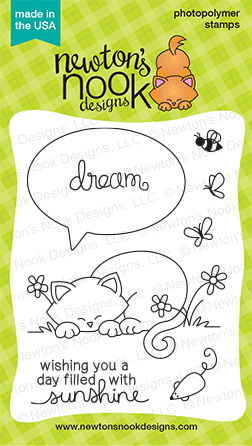 I really like the kitty and sentiments in this set! Your embossing is fabulous! Great paper piecing too! Adorable Card and thé perfect embossing folder too!! Love the simple layering and the fun color of your kitty! Thanks for sharing your CUTE card. LOVE how you colored up Newton. Such a sweet kitten! Love the "grass" you've created! Simply adorable! Such a cute set! Love your card! Super cute! I love the oval layering and the fun, bright colors you used! Wonderful card. Grear colors and layering. Love the dimension. I love the layering and your color choices. Great card!